1) SJBA is organising the 12th Annual Educare Program in SJBA in aid of needy students, providing them with school items to start the new school term. It is expected that about 500 needy students will receive the school items on 9 December 2018 (9am). Each student will receive a full set of school items which consists of school bags, shoes, books, stationary, etc. which costs about RM108.00. The amount may not be a lot but it is a simple yet significant gesture of ours to show our care and concern to poor students. We hope that through this simple but sincere gesture, the students are motivated to study better and achieve academic success and eventually success in life. This noble task can be achieved with the continuous support of our members and devotees. If you wish to sponsor one or more students, please contact Sis. Lily 03-56348181, 56315299. The Educare Program will be held in SJBA Shrine Hall. Hence the Sunday Puja will be off. 2) SJBA is organising the auspicious 28 Buddhas Puja beginning with an Inauguration Puja on 15 December 2018, 8.00pm to 10.00pm at SJBA Shrine Hall and the Grand 28 Buddhas Puja Ceremony on 1 January 2019, 6.15pm to 10.00pm. From 16 December to 31 December 2018, there will be daily chanting during the weekdays’ morning from 8.00am to 11.00am and in the evening from 7.30pm to 10.00pm. Other details will be announced soon. On Saturdays and Sundays, morning chanting will be from 8.00am to 9.30am and evening chanting from 7.30pm to 10.00pm. 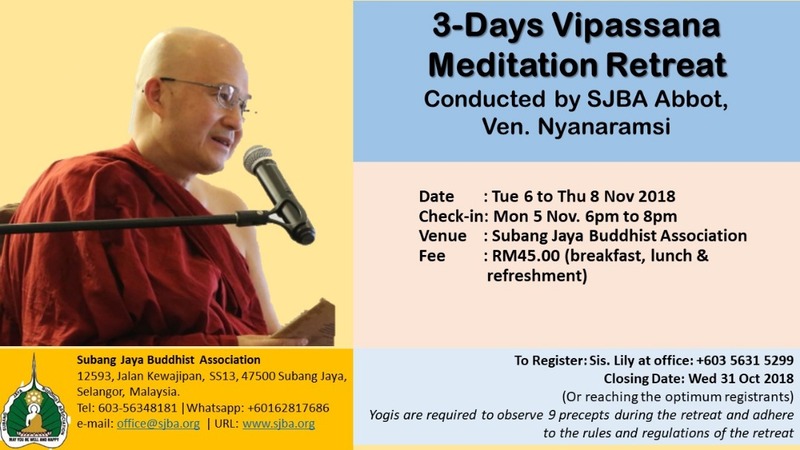 2) SJBA is organizing a 10-day Vipassana Meditation Retreat from 3 to 12 January 2019. 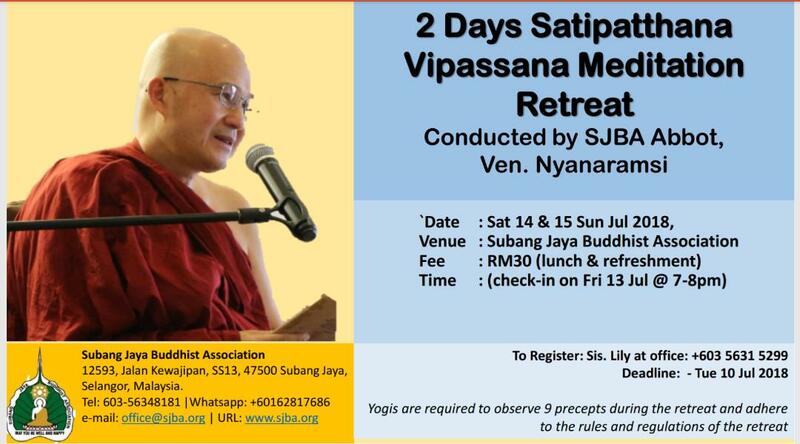 The Retreat will be conducted by Sayadaw U Sobhita. Sayadaw U Sobhita is a highly respected meditation teacher at the renowned Chanmyay Meditation Centre, Yangon, Myanmar. He was born in 1951 and was fully ordained as a Bhikkhu by the Most Venerable Sayadawgyi U Janakabhivamsa in 1970. He studied the Dhamma under Sayadaw U Tejavanta, Sayadawgyi U Janakabhivamsa and other famous Sayadaws in Myanmar. In 1983, he practised Vipassana Meditation under the guidance of the late Mahasi Sayadaw. Since then, he has been teaching the Dhamma, especially meditation, to devotees in Myanmar and abroad. 3) SJBA invite you and family and friends to a spiritual and mentally enriching morning at this Sunday’s Buddha Puja commencing at 9.15am with offering of lights, flowers and incense to the Buddha, chanting, Dhamma Talk, Blessings and Sharing of Merits. 1) SJBA is organising the auspicious 28 Buddhas Puja beginning with the inauguration on 15 December 2018, 8pm at SJBA Shrine Hall and the Grand 28 Buddhas Puja Ceremony on 1 January 2019. The details will be announced soon. 4) SJBA invite you and family and friends to a spiritual and mentally enriching morning at this Sunday’s Buddha Puja commencing at 9.15am with offering of lights, flowers and incense to the Buddha, chanting, blessings, Dhamma Talk on “The Ten Paramitta (Perfections)” by Bhante Ginnaliye Dhammaloka who is the Resident Monk of the Ohio Buddhist Vihara, USA, followed by blessings by the Triple Gem.